The whispers have been there all season. But Nashville Predators defenseman Shea Weber is too busy to listen. Weber doesn't even acknowledge that he knows that there's a new game of chicken being played among general managers around the National Hockey League regarding young, promising players who are about to become restricted free agents in the aftermath of the Edmonton Oilers signing Buffalo's Thomas Vanek and then Anaheim's Dustin Penner to offer sheets last summer. In order to stave off similar raids this summer, Washington has re-signed Alexander Ovechkin, Pittsburgh re-upped Sidney Crosby and Calgary rewarded Dion Phaneuf with a loud, headline-grabbing new contract. There's definitely nothing quiet about the way Shea Weber plays. His shot is loud and lethal. His bodychecks are noisy and downright nasty. Simply put, the 6-foot-3, 213-pounder from Sicamous, B.C., makes an impact at both ends of the rink. The here-and-now for him is hitting and shooting the Predators into the playoff mix, not worrying about how much money he can make as a potential free agent. "Shea's a great player because he’s very humble about what he does," said Predators coach Barry Trotz. "He has everything in perspective." Personally, this has been a season of catch-up for the 22-year-old defenseman, who dislocated his kneecap in the Oct. 4 opener against Colorado, missing 18 games. Then he was sidelined for 11 games between Dec. 23 and Jan. 13 because of a leg injury. "It’s tough to get it going when you go out in the first game of the year," Weber said, shaking his head. Especially when the Predators were already minus captain Kimmo Timonen and stars Paul Kariya, Peter Forsberg and Tomas Vokoun, along with up-and-coming forward Scott Hartnell at the start of the season. Ownership in Nashville was in a state of flux. The team that had 51 wins last season had to be broken up for fiscal reasons. What that meant was that Jason Arnott, J.P. Dumont and youngsters like Weber, Ryan Suter, Dan Hamhuis and David Legwand would have to take over the leadership roles on the team. That didn't figure to be a problem for Weber, coming off a season in which he had 17 goals, 40 points and a team-best 165 hits. "On every level of hockey, once Shea started feeling comfortable, he's always excelled," Trotz said. "He reminds me of a young Rob Blake the way he can shoot the puck, the way he can step up into the play offensively and the way he can be a physical force on the defensive end." Weber's teammates think Shea will, in time, be comparable to hard-hitting and hard-shooting Phaneuf, whom the Calgary Flames took off the potential restricted free agent list with a whopping six-year, $39 million contract. "I think Shea is just as good," Suter said when asked about Phaneuf's big contract and what he thought Weber might command on the open market. "Shea is definitely an impact player. He's the real deal." Don't think for a moment that Predators GM David Poile would let Weber get away -- or that he will let negotiations get to July 1. And Weber isn't the kind of kid who would leave a place like Nashville, which he's come to consider a lot like the small town of Sicamous. Love for the game; that's Shea Weber's mindset. "I'll never forget how much my brother and our friends growing up just loved to play the game," Weber recalled. "In the winter, we'd go over to the rink and play from breakfast until there was no light left. In the summer, we borrowed a couple of old nets, put them in the backyard and would shoot all day. "My dad worked in a saw mill and brought us the plywood that would serve as our launching pad to practice our shooting. That kept me and my brother and my friends busy. We would have all kinds of competitions. I remember my mom would have a heckuva time getting us to come in to eat. Usually, the food was cold when we finally went in the house, but we didn't care. We were ready to go back outside after we got a bite to eat." When Shea went to Kelowna to play junior hockey, he quickly became known as a winner. He helped the Rockets to three straight Memorial Cup tournaments, winning in 2004. He also won a gold medal for Canada at the 2005 World Junior Championship and last summer was part of Canada's World Championship team that went 9-0 and won the gold medal in Russia. This is a kid who loves the comedy of Will Ferrell, the variety in rock music provided by Canada's Nickelback, fishing, boating, baseball and golf. He also loves to be ultra-competitive, pounding pucks with his brother and recording a shot speed of 78 mph when he was just 13. That speed has risen to the upper 90s now. "Being under the pressure of junior hockey at a young age was something that helped me come a long way," Weber recalled. "Then my eyes were really opened up to a new kind of drive and determination once I got to the NHL. You don't just step on the ice and play like you did as a kid. There's so much more preparation to the game at this level." Despite all the attention in junior hockey, Shea said he wasn't surprised that he lasted until the second round, no. 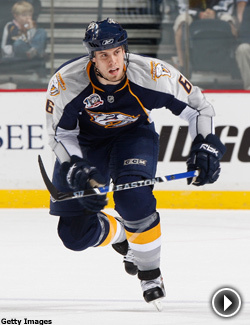 49 overall, in the 2003 NHL Entry Draft in Nashville. "Honestly, I thought I was going to go later than that,” he said. “I didn’t know what to expect, it was a just wait-and-see kind of thing. I remember I was just sitting there for awhile and then I heard my name, because I was a little surprised I was picked so soon." Obviously, the Predators saw plenty of Weber, especially on that gold-medal winning World Junior team where he was surrounded by potential NHL players like Phaneuf, Ryan Getzlaf, Eric Staal, Jeff Carter, Marc-Andre Fleury, Brent Burns and Nathan Horton. The Preds clearly saw a fierce competitor and ultimate warrior in Shea. Today, with teams like Nashville trying to re-sign Weber, Anaheim looking to get a new deal done with center Corey Perry and Philadelphia closing in on a new contract with Jeff Carter, it's clear that young, impact players are in demand. Those teams don't want their prospects to flee while they are still developing into prime-time players. The fact that Shea Weber clearly has a one-track mind that includes play, compete and succeed -- no time for losing -- makes him even more valuable to the Predators. Obstacles? Weber had to play one more year in Sicamous, because he was just 5-9 at a time when Western Hockey League teams didn't think he was big enough to play defense there. That just made Shea stronger of body and mind and increased his desire and work ethic to show the skeptics he could excel at any level. "Coming from a small town, I guess there were questions," Weber said. "But ..."
But, Weber silenced those questions through intense effort and preparation. "I remember watching Al MacInnis shoot the puck,” Weber says in just one example of his dedication to the game. “I remember watching his technique -- his weight shift, his hands. Everything." Sign up here for your FREE Playoff Fantasy Hockey Challenge team, exclusively on NHL.com. But the preparation didn't stop there. He also watched and admired the overall defensive game of players like Jason Smith and Robyn Regehr. Quickly, though, Shea Weber's attention switched back to the Predators and the present -- and of how important it is to the team, the city, the new owners and the fans for Nashville to make the playoffs. That's first and foremost on Weber's mind. "It’s crucial to get in," he said. "We want to show the new owners that we’re capable of winning; that the franchise is going to be good for a long time." Restricted? That may be his free-agent status when his current contract ends June 30. But there are no restrictions on just how good Shea Weber can be. Eleven and counting. That's the league-tying number of shutouts the goaltending tandem of Pascal Leclaire and Fredrik Norrena have after Norrena blanked Chicago 4-0 on March 26 for his second shutout of the season. The 11 shutouts tie them with the Rangers for the League high this season. It's also one more shutout than Columbus recorded during the previous three seasons combined (five in 2003-04, one in 2005-06, four in 2006-07). ... Manny Malhotra continues his hot streak point-wise into the final week of the season. But, in the locker room, Mlahotra gets just as much credit for his work in the faceoff circle. He goes into the final week of the season second to Nashville's Scott Nichol among players who have taken more than 600 faceoffs this season with a 59.0 faceoff percentage. He's 95-for-143 of late, good for a mind-boggling 66.4 percentage. Remember those trade deadline-day trades of defensemen Bryce Salvador to New Jersey and Christian Backman to the New York Rangers? Well, since those deals, the St. Louis Blus are a woeful 2-10-2. Can we draw any conclusions? You bet. The Blues, without Salvador and Backman, may have the slowest defense in the NHL right now. Erik Johnson is getting more ice time and thriving. Ditto with Barret Jackman. But the rest of the group seems to be skating in concrete most nights. ... You could say that Jackman is out to prove to the Blues that he's worthy of the four-year, $14.4 million contract extension he received Feb. 25. He's a minus-12 on the season, but has been a minus in only 3-of-14 games since he re-signed. ... Jamal Mayers is one of those ever-important secondary scorers on the Blues. While he hasn't produced a lot of goals, he has provided plenty of scoring opportunities. Twice in the past month, he tied a career-high with seven shots on goal in a game. The week ahead -- With Nashville's playoff life at stake, it's very important to note that the Predators have a 15-8-4 best record against Central Division foes. The Preds' first order of business in the final week of the season is Detroit. The Preds had a chance to win the season series from the Red Wings for the first time before the two teams played March 20, but Pavel Datsyuk's two third-period goals gave Detroit a 6-3 victory. Nashville also has a home-and-home matchup against the Blues in St. Louis on April 1 and in Music City two nights later. After seeing the Blues win the first three games between the teams, the Predators have won the last three -- with Shea Weber's goal 40 seconds into overtime Feb. 16 knotting the series. The Preds finish the season April 4 at Chicago. The Blackhawks lead the series against the Predators 4-2-1 -- the winning team scoring at least five goals in five of seven meetings. Patrick Sharp leads the way with six goals and one assist. ... The Blackhawks have a home-and-home series against the Red Wings in the final week, playing April 1 in Chicago and in Detroit on April 6. The Wings have won two straight in the series after losing the first four to the Blackhawks.